I'd like to announce that over the next few weeks, I'll be experimenting with something on this blog: a daily riff on some exciting thing I'm reading. Nothing long — just some short tiny ideas! Little bon mots. 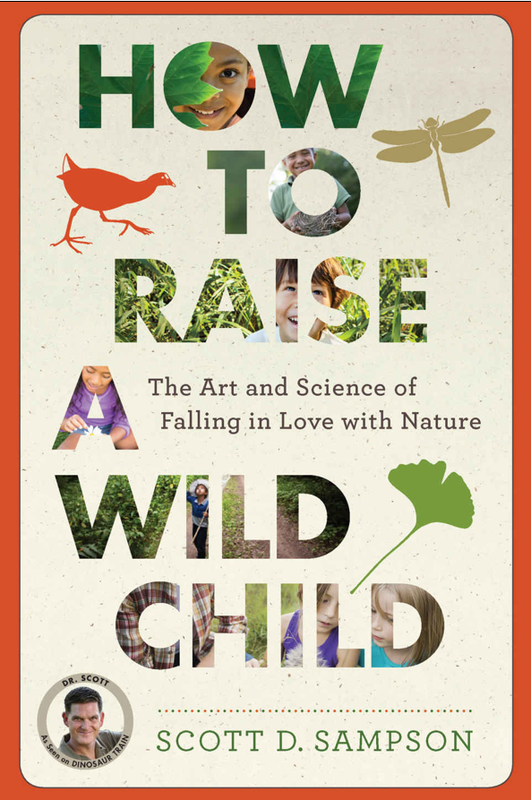 First up: riffs on the fantastic book How to Raise a Wild Child: The Art and Science of Falling in Love with Nature, by the paleontologist Scott D. Sampson. Because it turns out explaining your life's work to others is hard. I find, as an ADHD-type personality, that it's really easy to talk about new ideas. But talking about the big ideas behind our vision of school? The foundational ideas? The conclusions I reached a decade or more about? These oldest, most important ideas have become the source code of my thinking: they've become almos invisible. They're powerful and rousing, but not in a zippity-doo-dah sort of way. In order to explain our conception of what schooling can become, I've got to excavate these foundational ideas. And I think that riffing off of the formative books I've read over the years might be a good way to do it. Anyhoo, enough of the navel-gazing! Look forward to a short post every weekday, in addition to the longer, more fresh-idea-bearing essays. Getting started on the blog: a how-to! What if schools could be communities of vibrant intellectualism? What if they could take seriously our knowledge of what humans really are, and our best understandings of what skills and dispositions the world will need in the future? What if a new kind of school could unveil the fascination of the world to students, help them grow expertise, and construct purposeful lives? We're a group of educators working to forge this new vision of education. We're making schools that cultivate Renaissance people: men and women who find the world interesting, develop mastery in diverse fields, and build lives of meaning. We're proud to report that our first affiliated school, the Island Academy of Hilton Head, has just launched, off the coast of South Carolina! Whilst we're working with Island Academy, we're also planning to launch our second school — tentatively titled Da Vinci — in the Seattle area in Fall 2017. It will start with grades K–2, and gradually grow to K–12. Our vision is centered on the values of love, mastery, and meaning. You may be interested in watching a quick YouTube video we've made to explain what, precisely, we mean by these — and how they can form the foundation of a new vision of education. If it's our specific curriculum you're interested in, you'll want to take a look at the following pages. A word of warning: our curriculum strikes some as weird! This is probably a good sign. Our arts curriculum attempts to immerse students in wonderful works of artistic genius — and from there helps guide students to create such works themselves. You may be interested in our approach to how we plan to engage kids in paintings and sculpture, film, dance, music. You also may be interested to hear how we'll help them master drawing, music, and film themselves. Our reading curriculum is at the center of our school — if we don't help students fall in love with reading, we'll have failed in everything! You may be interested in our post about how to begin to help students love to read. More posts on this are on the way. We believe that math should be made much easier than it is — and also much harder! We use JUMP, a guided math curricula that helps all students gain a profound understanding of K-12 math. We also use a tool that Brandon invented — Deep Practice Books — to guide students into wrestling with math puzzles far beyond their current level of expertise. Related, we also engage kids in coding! The world is made up of stories. Traditional schooling de-emphasizes this, and presents social studies as a mess of terms and facts to be learned. Big ideas definitely have their place, but the core of history is stories. We're devising "Big Spiral History" — which began as Brandon's master's project — as a K-12 curriculum that engages the whole of the universe's history, starting with stories — first told by teachers, and then retold by students. We also think it's helpful for kids to expand their view of the world by meeting people in their neighborhood and regularly drawing maps. All students can become wonderful writers. We're working on shaping our writing curriculum right now (feel free to poke us to prod us along in posting about it! ), but one of the underpinnings of helping kids become good writers is to give them regular experience in being good speakers. Philosophy for Children informs the way we approach everything — and we're making question-posing and answer-hunting part of the daily curriculum. Thinking is helped along by deep, interconnected knowledge: something that modern schools don't much help to grow. Like a growing number of schools, we'll be using Learning in Depth. Knowledge is grounded in feeling — which is why we'll use Leitner boxes to allow kids to treasure the greatest things they've learned. Brains are parts of bodies; we think better when our bodies have been moving. Thus, we get kids to move, a lot! The opposite is also useful: we often think better when we can slow ourselves down. Thus, we train kids in meditation, and set policies that help them get a sensible amount of sleep. We're not ants — humans need independence (and more than most schools provide) to flourish. Yet students also need group community, and adult guidance. To encourage autonomy, we use a Montessori-inspired practice of independent work time. We also help kids take on independent (anchor) projects, and Learning in Depth projects. Churchill once quipped, "We shape our buildings; thereafter our buildings shape us." How classrooms are designed matters much — they can help us feel, and even help us be more creative. Our classrooms are covered in useful knowledge, including our walls of talking dead people. Letter grades (as they're traditionally used) don't work so well. Here are some of our thoughts on how to make a better feedback system for rich learning. Nature has equipped us with a few ways to learn foreign languages, but schools don't use them. Here are our plans on how to help all students learn languages. We're lovers of Imaginative Education — the educational approach devised by Kieran Egan (and the good folks at IERG). IE holds that humans are built to learn those things that they find interesting — and that virtually everything in the world is interesting! The secret is breaking through the outer layer of boredom. Human cultures, over the millennia, have devised practices for doing just that — schools can use those practices. Brandon is preparing to explain this in a TEDx talk — for an in-depth version of IE (and how IE can be understood as brain science, or as an application of human nature), take a look at this four-part YouTube video. We think that the burgeoning academic study of human nature has much to offer a new vision of education. We can move beyond the well-worn Traditionalist/Progressivist wars by understanding that learning can be both natural and unnatural, in complex ways. Look: we're crazy dreamers. We're ultimately in this to help mend the world. If you come away from this blog with the idea that we're making schools for the sake of making schools, well, the blog has failed! If you're interested in learning more about our new kind of school, please don't hesitate to write us! Shoot me (Brandon, the main writer of this blog) an e-mail at brandon.hendrickson@gmail.com. Well, I did it: I finally made a helpful introduction to this blog. The above is from our new about us page — feel free to point people to it, if you're interested in forwarding along word of our little education revolution! Oh my: we're in business! Exciting things have been cooking in the last couple months. I've held back on writing about them for fear that that they'd change, but now that they've solidified (and I've regained control of my calendar), I'd like to present you with: the plan moving forward. He's now living off the Eastern seaboard, on Hilton Head Island (in South Carolina and roughly between Savannah, Georgia and Charleston, North Carolina), where's he's been asked to start a school. A school of his own design. To open in the fall. And he's asked me to help design the curriculum. Ladies and gentlemen: it's begun. Here's the website for the school — The Island Academy of Hilton Head. What could schooling look like, if we reimagined it from the ground up? How could love, mastery, and meaning infuse everything we do? And how could every subject be fueled by Imaginative Education? We’re two teachers who have contemplated these questions for years, and we suddenly have the chance to bring such a school into being. This fall we’ll be opening a school on Hilton Head Island, off the coast of South Carolina — and we’d like your help in fleshing out the curriculum! What could history look like, in such a school? Math, science, and literature? Drawing, music, and dancing? Physical education, cooking, and meditation? This will be a venue to share your hare-brained notions and hard-won wisdom. We’ll spend some time sketching out our thinking so far, but half the workshop will be devoted to eliciting participants’ fresh educational thinking. Come with your hopes. Leave with some bigger ones. So now I just need to lay out all of the ideas for the school, in condensed form — and quickly! What a wonderful situation to be in. I don't advertise this blog, so if you're reading this, it means that you know me, and that I trust your educational instincts. Oh, and one more thing: I'm, in general, way too sensitive. (It's something I'm working on.) But in this forum, I'm not looking for pats on the head. I don't especially need to hear that these ideas are cool — believe me, I'm already convinced enough of that! If patting me on the head makes it easier for you to give more critical advice, that's perfectly fine — but don't just say nice things on my account. All right: Look for three pieces of curriculum (programming, games, and art immersion) in the next day. Now that we've laid out the three major goals of our school — the three central criteria of love, mastery, and wisdom on which all our decisions will be based — we're going to start playing around with specific curricular elements. That means looking at scholastic subjects. What might our reading curriculum look like? Our writing curriculum? What role can cooking play in our school? Drawing and painting? How about math — how might that shake out? How might we do physical education, and music, and history, and philosophy? How about world religions? How about the environment? It also means taking a broader angle on school life, and philosophy of education. How can we address community cohesion, and individuality? How can we give kids hope for success, and help develop creativity and resilience? How can we bring the outside world into the classroom? How can we synthesize helping kids fit into society, and helping them transform society? Most educational reform movements, quite sensibly, limit themselves to addressing one of these. We're going address all of them at once. There's a fantastic moment in an Orson Scott Card novel (I forget which one, exactly) in which the team of brilliant adventurers (all his novels feature a team of brilliant adventurers) are trying to take on a multitude of pressing issues: making contact with a sentient species of virus, hustling a corrupt intergalactic senate, and figuring out extra-dimensional, faster-than-light spaceflight (thus necessitating unraveling the fundamental patterns of physical reality). One character says that any one of these problems would be enough for them. She points out that in the previous millennia of human thinking, nobody has solved a single one. The team should limit themselves, she argues, to just one goal. On the contrary! declares our hero. The fact that no one has solved any of these problems should tell us that they're not solvable by themselves. To get to the bottom any of the mysteries, he says, we need to get our insights from all the others. We need to solve all of them together. Well, I don't know if that's good advice for figuring out warp drive, but I've definitely found this advice to be useful when thinking about schooling. Math pedagogy gives insight into reading pedagogy, which in turn gives insight into how to cook. And so on, and so on. We can understand teaching any subject better if we think about how to teach any subject. I suspect this "broad" approach will be useful with executing this new form of schooling, as well. That is, students who nurture a love for various subjects will be more open to mastering them. Students who experience the profound excitement of cultural history will be more open to learning to cook (and eat!) the signature dishes of each culture. What students learn in each of their subjects will give them new perspective in every other subject. So in our school, we're going to try all of these big ideas out at once. This sounds a little nuts. Frankly, this seems like the definition of quixotic. But it also seems like the only truly sensible way to move forward: to try out a basically new approach to K-12 education. So: expect a welter of ideas that only vaguely seem to connect together. In the end, they all will. ... for ten whole days. Sheesh! I was (as chatted about in August 14th's post) geared up to launch into a deep consideration of what the big goals of the school could be. And then: a church happened. I was tapped by a friend to help start up a non-religious church — an experiment in community building to provide some of the benefits religious folk (e.g. Christians) derive from their religious congregation (e.g. churches) without having to import any of the beliefs (e.g. God, an afterlife). This excites me tremendously — I have an interesting background as a religious believer (and, these last seven or so years, as a still-oddly-religious non-believer) — and I think my experiences here could help me grow some of the skills we'll need to start up this school. I started a new blog — churchforatheists.com — to raise some of the possibilities such a non-religious assembly might have. There may be a time limit to this: we're planning to launch the Seattle Assembly (that's the name we're working with at present) in November; much of the public pondering I do will be of special use before our first launch. For the last 10 days I've tried to split my attention between the two blogs, a noble attempt which has entirely failed. I think the wise thing to do — Lee, do you still agree with me? — is to take off the rest of August and the whole of September from this blog (schoolforhumans.org), and to evaluate at that point what the best course of action is. So is this blog done with? Life is constant reinvention — online life, much more so! I had been planning to walk through Kieran Egan’s “Learning in Depth” idea last week. Learning in Depth (LiD) is a powerful idea — a strong contender for a “teensy tweak that changes everything in schooling” award, if such an award exists. And then I realized that I was about to pitch Learning in Depth without first identifying the need for it. And then I realized that we’ve been outlining this school without first identifying the big problems in American education that it will attempt to rectify. What are the primary things we want this school to do? What are our overall goals? I realized we’ve been unintentionally inverting the customary arrangement of steed and tumbrel: that is, we’ve been putting the cart before the horse. what do we really want this K-12 school to do? I invite you, beloved reader, to offer your own goals for such a school in the comments. Don’t hold back: let’s get out all the possible goals we care about, and then decide on which trump the others. Identifying these “big items” will help us make other decisions — say, whether to go public, private, or charter, or whether to have grades or badges or portfolios. Presumably, this will be one of the most important conversations we have, so ideate away! Should we start this school with the early grades (preschool, say, or kindergarten) or the upper grades? You and I both work with, and love thinking about, the upper grades: it’s where our expertise (and our highest aspirations for education) lay. There is no second reason. As kids grow, it’s easy to populate the higher grades. As kids grow, you have a population to engage in progressively more complex and exciting learning — understanding (and relationships) can build. An early grade-school education can be more intellectually vibrant than anything I experienced in high school — or, for that matter, college. I think I could be very satisfied in working in such a school. Someone is already doing this sort of education — we don’t need to invent it ourselves. This may be simpler than we think. Certainly starting the school will be harder than I can possibly imagine — as another school founder told me, “Starting a school will take everything you’re willing to give it — and more.” But the theory behind the school may be simpler than I’ve suspected. At lunch after the Corbett presentation, one of the teachers told me that the teaching staff more or less only practices Imaginative Education. Teaching according to IE, she said, is so challenging and all-consuming (and, she added, deeply rewarding) that she was skeptical if anyone could mix it with any other daily lesson-planning theory. There’s a final point which might be compelling here. Lee, you and I have kids. Starting this school with the earlier grades, and sooner, rather than later, would allow us (or, at least, Kristin and I) to enroll our kids in the school from the get-go. Apologies, and a tweak for the week! It was like showing up to, say, a conference on hummingbirds, only to sit through presentation after presentation by people talking about how they’ve trained their chickens to hum, or about how they theorize extinct quails might have emitted a soft buzzing noise. Not exactly wrong, mind you — these are all humming birds — but really not what we the conference goers came for (in many cases, traversed oceans for). In other words: adventures in missing the point. I’m very glad I went, however, if only for one particular session: that of the staff of Corbett Charter School, of Corbett, Oregon. Their presentation was, for me, a religious experience: for the ninety minutes I was transfixed, jaw hanging down, at their description of what they’ve been doing. To state this very briefly, they described the most delightful, bewitching, and magnificent learning community I’ve ever heard of. It met my highest hopes for what our school could be (at the K-6 level, which was the focus of their talk), and ever-so-slightly exceeded them. And now that I’ve seen that, I have three questions I’d like to ask, which, gods willing, I’ll post on this week. School, we suggest, is due for a from-the-ground-up re-imagining. This sort of language isn’t particularly controversial — if anything, the 21st century is a Wild West of educational reform. But when we listen to many would-be educational innovators, we hear oodles of reasonable-sounding tweaks (make class more relevant! less rote! more individualized!) and a real lack of compelling ideas. Listening to the rhetoric, one might come away with the notion that solving the problems of schooling is simply a matter of rejiggering the ideas we already have. Mind you, there is some practical wisdom in careful rejiggering. Typically one should avoid sudden, sweeping jolts to complex systems. And, of course, we should be careful not to throw out the baby with the proverbial bathwater. Our schools aren't “broken”: many wonderful things happen in them on a daily basis. And perhaps we should take pride in even some of their more mundane achievements. A few centuries ago, only a sliver of the population learned how to read and write; now virtually everybody does. Hooray! And yet... when we reflect on our own educational experiences, it seems like a waste to move through thirteen years of compulsory schooling and have so little to show for it. The world teems with stories to learn, insights to achieve, and potential selves to consider, and yet kids are routinely bored and mentally checked out. Wonder, wisdom, expertise, and passion are the exception, not the norm. Schools, we'll be suggesting on these pages, can do better. How can we design a school for human beings, with all our species’ quirks and eccentricities? Conducting this conversation (and building a school) will force us to bring together insights from disparate academic disciplines. What can we learn from religions about how to knit a community together? What can evolutionary and cultural psychology teach us about what really motivates people? How might architecture suggest we construct external environments that develop human excellence? What does cognitive psychology suggest about our intellectual potential — and our limitations? How can anthropology and sociology inform our understanding of how cultures transmit information and inculcate values? Moreover, envisioning a new way of “doing school” will require that we steal shamelessly from divergent (even furiously opposing) practices of education. What can we learn from Montessori and Waldorf schools? What can we glean from John Dewey? What does the renascent classical school movement have to teach us? We’ll look, too, at instruction that happens entirely outside of brick-and-mortar schools — art academies and football camps, vocational apprenticeships and video games. Maybe most importantly, pursuing a new form of school will require that we move past our own idiotic theories and ideological blinders. We (Lee and Brandon) have spent the last few years kicking around our own ideas, but here we want to open them up to scrutiny — our own, and that of a community of thoughtful educational thinkers from many philosophies of education. In line with all of that, we’ll be spending the first two months — from late June through August — confined to formulating the questions we think most need answering. This summer, expect posts exploring what the goals of a school could be, and the roles expertise, joy, self-exploration, and everything else might play. If any of this interests you, it’s a pleasure to have you here — read on!